It's 65 days more till Christmas! A little bit more than two months to the silly season! Shopping malls are already filled with trimmings and marketing ploy to make us stay at the malls longer and shop till we drop. Well that ain't working with me. You see, I hate shopping. I hate shopping malls. I hate shopping malls during the Christmas rush especially. Usually, if there's really a need to go in there, I'd dash in and out in less than hour. Not that I don't shop for clothes and shoes. I do. It's just that when I'm out shopping, I pretty much know what I want and get it. Straight up. But with food. Food shopping? I'm more patient and take time. Savouring the smells of seasonal fruits and fresh veggies, browsing at the seafood on offer and cuts of meat for the day. I usually shop at the markets and my favourite Asian butcher and fish monger locally. And that's my happy place. So usually Christmas gifts to family and friends are always food related - cookbooks, kitchen and dining gadgets and home made goods. Now talking about Christmas always brings me dinner table thoughts. You know, menu for the Christmas eve dinner, Christmas breakfast, Christmas lunch, Christmas dinner and every single meal all the way to New Year's day. It's always exciting to try new dishes in preparation for that special day. Often times, anticipating the traditional dish becomes the highlight of the meal. Now this chicken dish can be made any day of the week, a weekend lunch or dinner or try it this holiday season. The colours do match the holidays too. 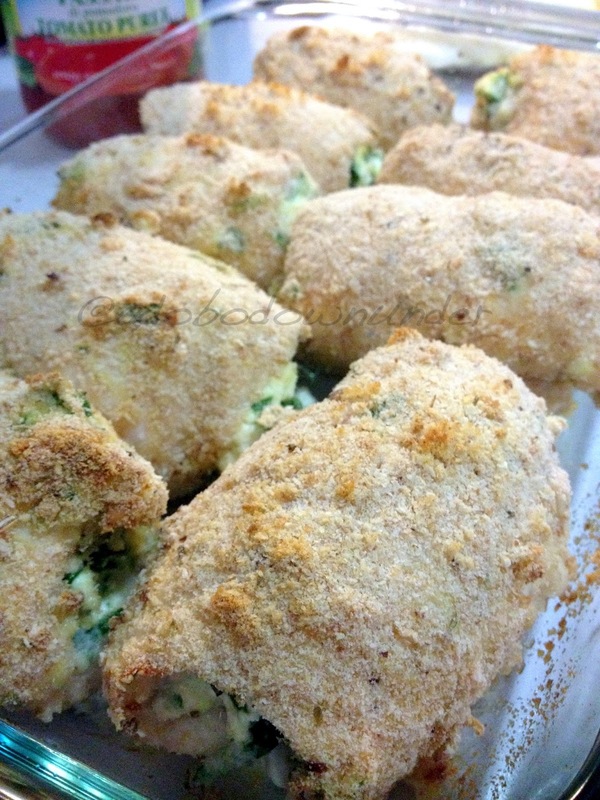 This recipe is adapted from Skinny Taste with the ingredients slightly changed. 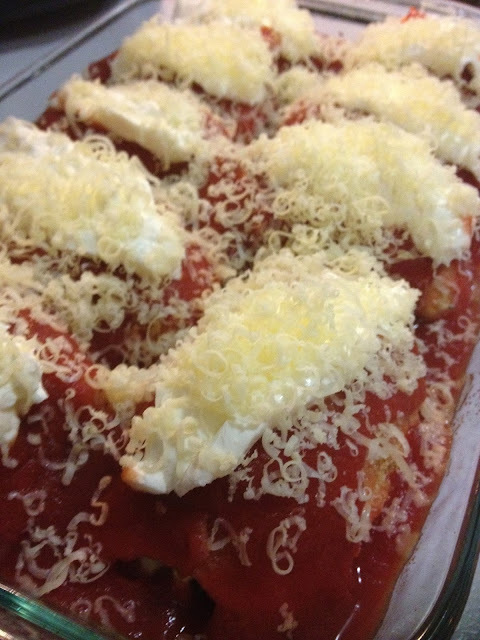 Prepare an oven proof rectangular dish. Spray with canola oil and set aside. Prepare 3 separate bowl, one with breadcrumbs and one with the beaten eggs. In a medium sized bowl, combine ricotta cheese and spinach and mix with a fork. On a large chopping board, work the chicken pieces one by one. 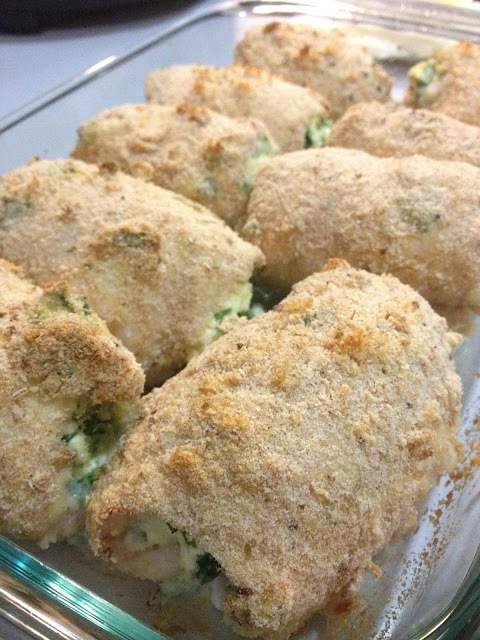 Spread the chicken fillet flat, spread some ricotta-spinach mixture and loosely roll with the seam side down. Repeat with the remaining chicken pieces. 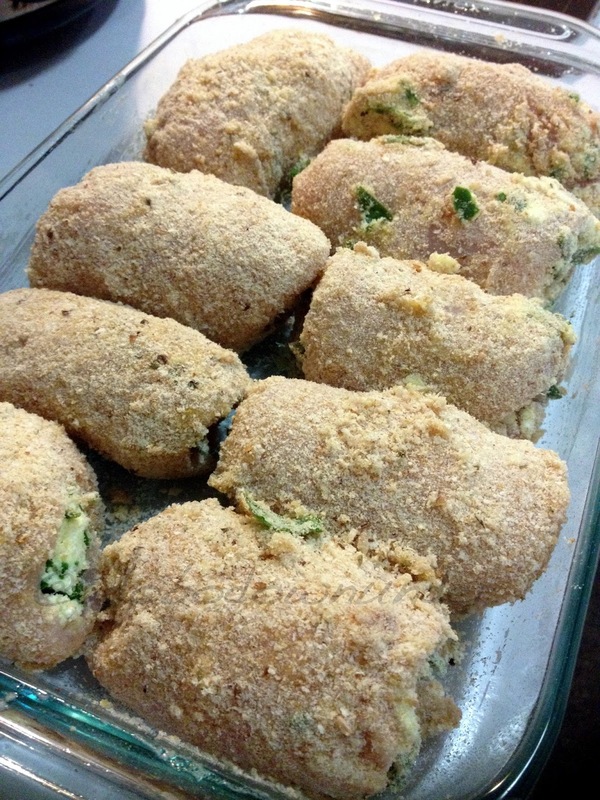 Coat the chicken rollatini in the beaten egg, then roll into the bread crumbs. Place in the prepared baking dish. Repeat with the rest of the chicken pieces. Lightly spray with olive or canola oil. Remove from the oven then pour the passata sauce over the chicken pieces. 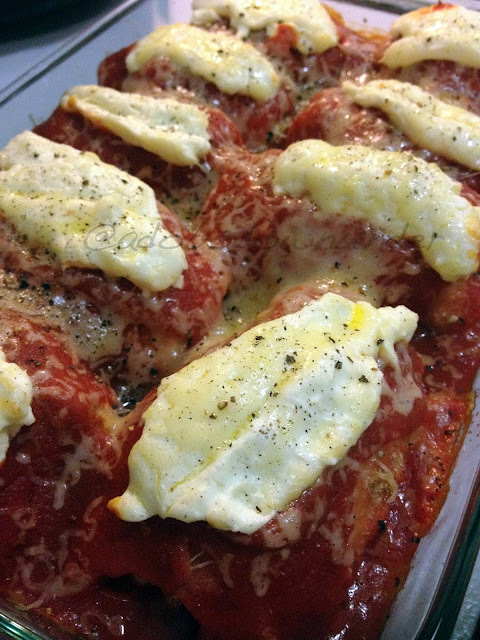 Place cream cheese slices on top of the chicken, then the grated cheese. Bake in the oven for a further 5 minutes or until the cheese has melted. Serve in individual portions with some salad or roasted vegetables. And served with some extra explosives on the side! Ha! Now this has delicious written all over it. We've made this many times using bocconcini as topping and some mozarella. Don't you think it looks like Christmas? Now... time to get some list going. Thank goodness for online shopping! Hahaha!